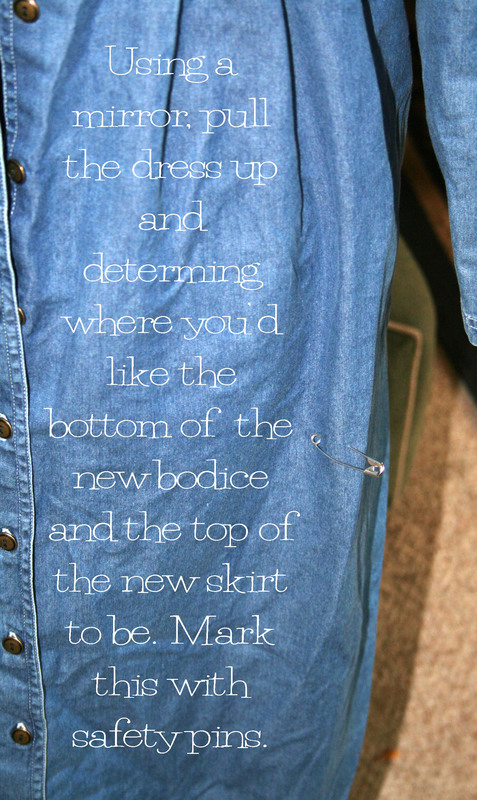 Who doesn’t love a good denim dress? Eddie, Eddie, Eddie! What were you thinking? No wonder someone dropped it off at the thrift store. They probably laid it on the doorstep, rang the doorbell and ran. Really Eddie, you need to get out more! Should I go for the J Lo look? So I channeled my inner Edward Scissorhands and got right to work. First determine where you’d like your new waistline. 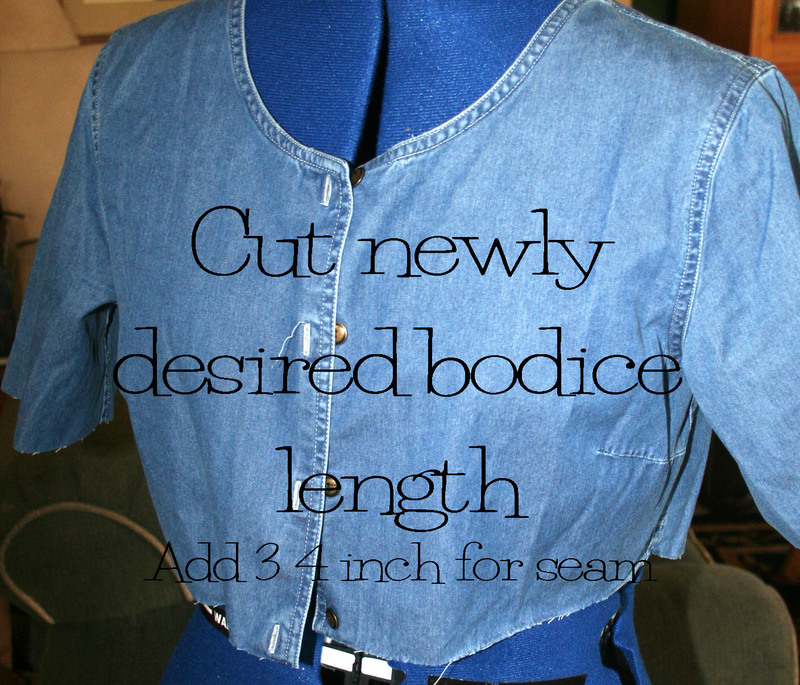 Cut your new bodice length leaving enough for a seam. 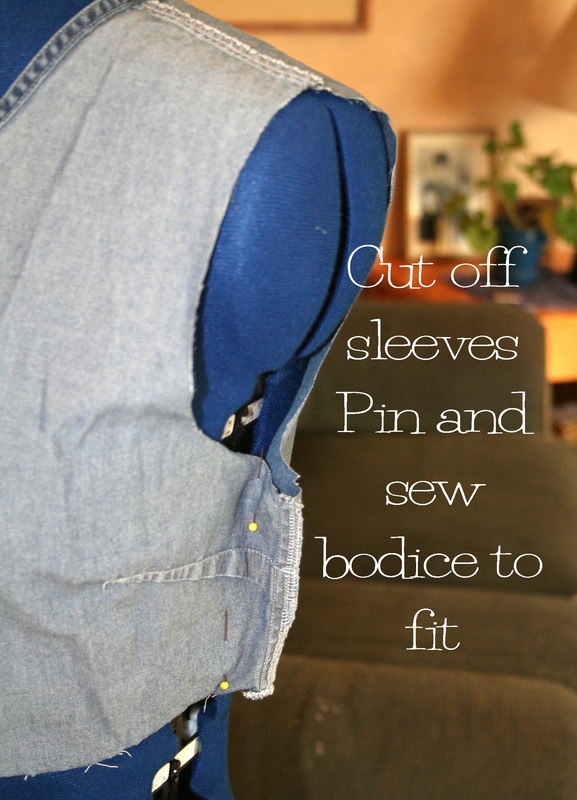 Cut off the sleeves then pin and sew new side seams to fit. 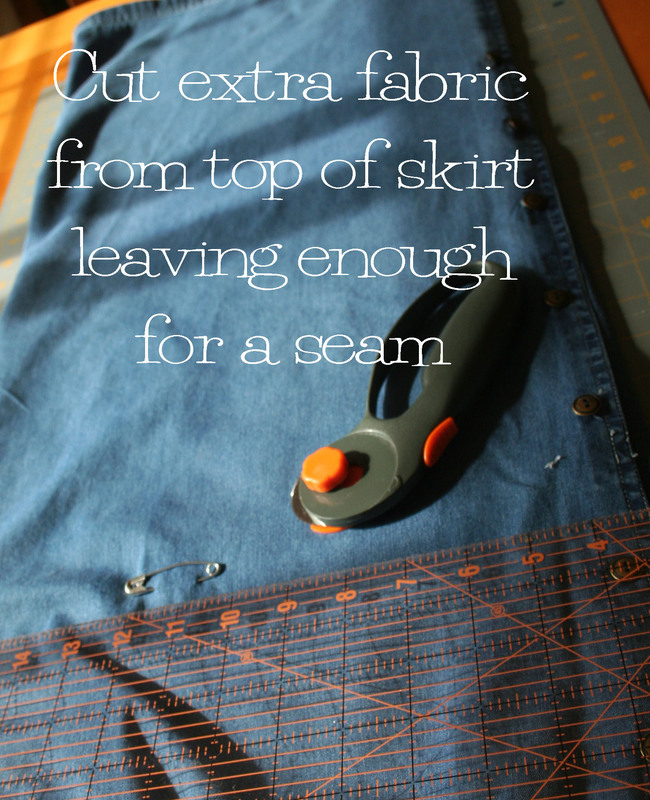 Cut extra fabric from the top of the skirt leaving enough for a seam at the top. Pin and sew new side seams. 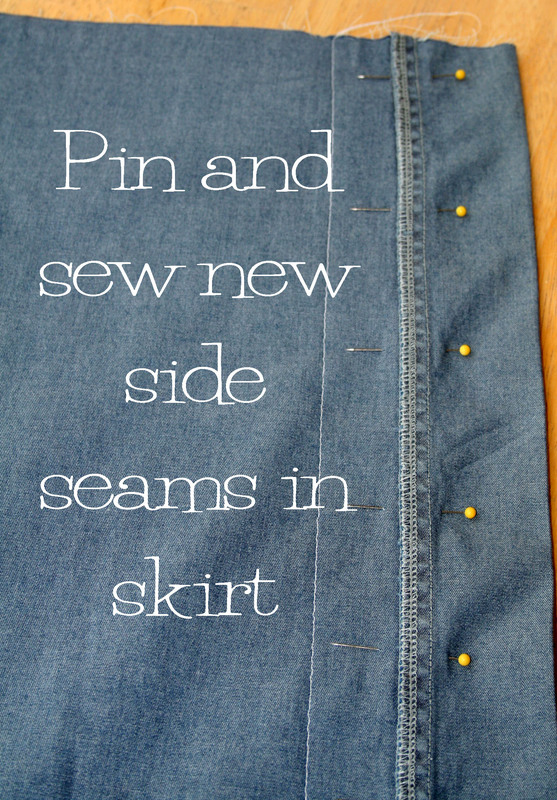 Sew skirt to bodice, adding pleats or darts in the front and easing the back to fit. I used the fabric that I cut off from the middle of the dress to make the flounce ruffle. 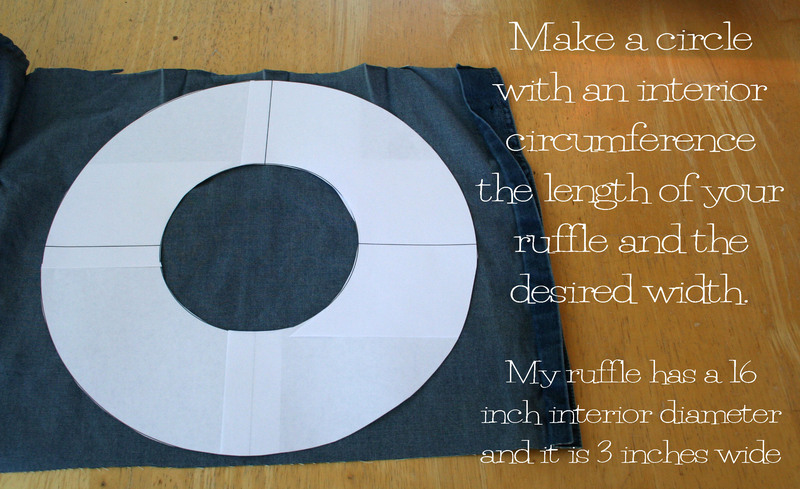 After cutting out your circle piece of fabric, cut a straight line from the outer to the inner circle to open it up. 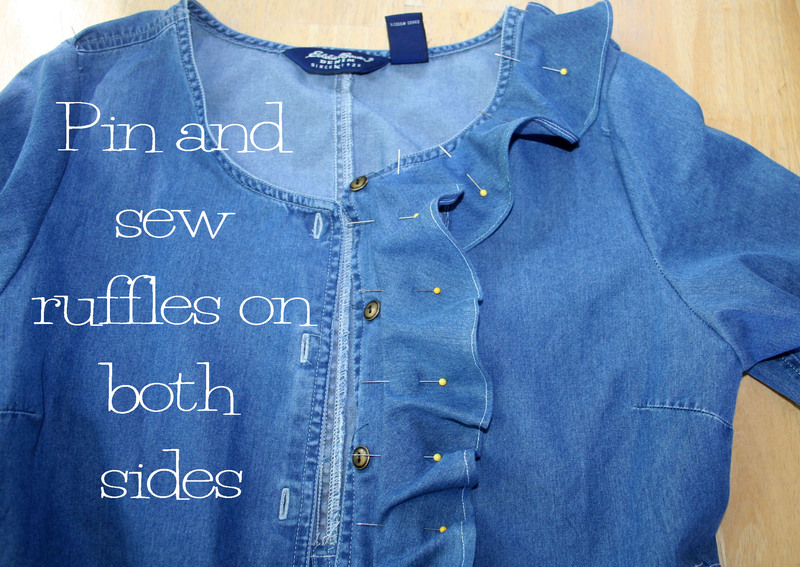 Place the inner circle along your neckline, fold it under, pin and topstitch. I ended up tacking my ruffle in a few places but I think if the edge was serged tacking might not be necessary. Next put the sleeves back in place and hem the bottom of each sleeve. 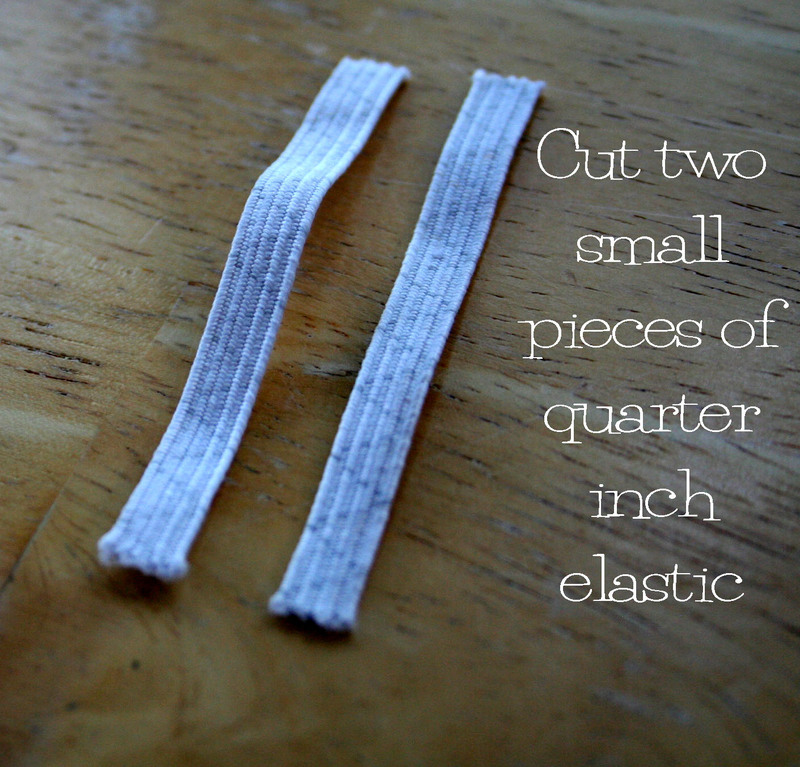 I thought it would be fun to add a decorative gather at the bottom of each sleeve so I cut two small pieces of quarter inch elastic. 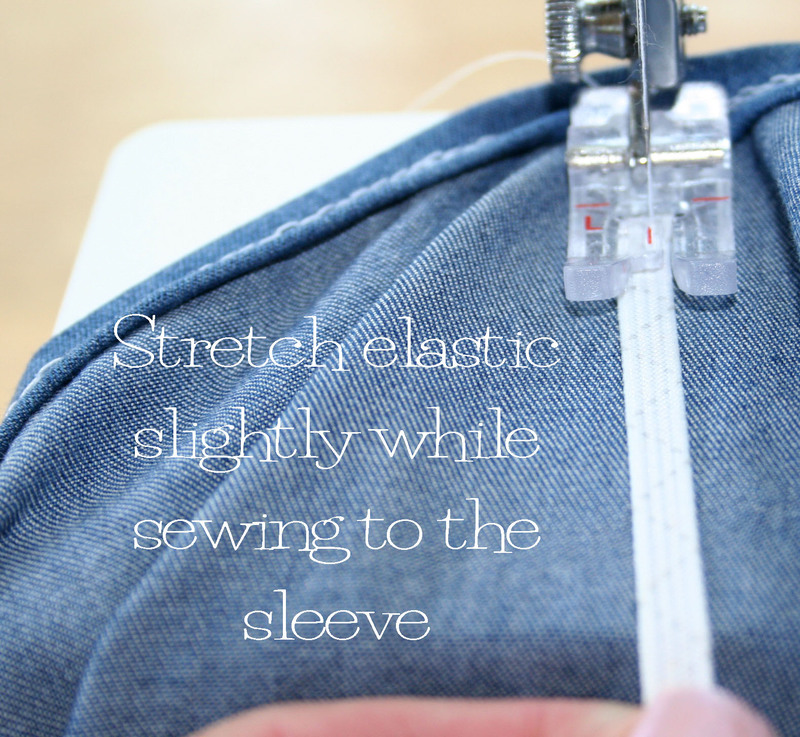 Place the elastic on the inside of your sleeve and stretch slightly while sewing. 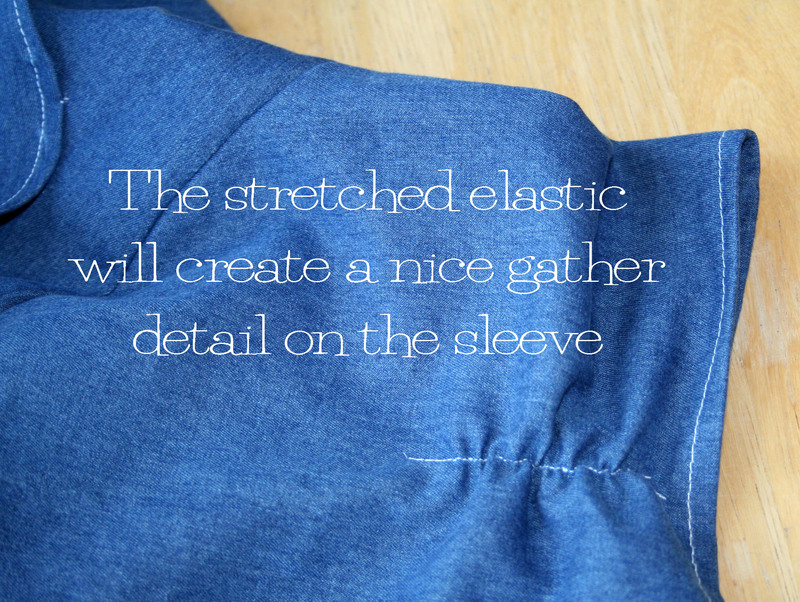 This added a nice detail to each sleeve. Ok, so I don’t look EXACTLY like J Lo. But it was fun to think about! 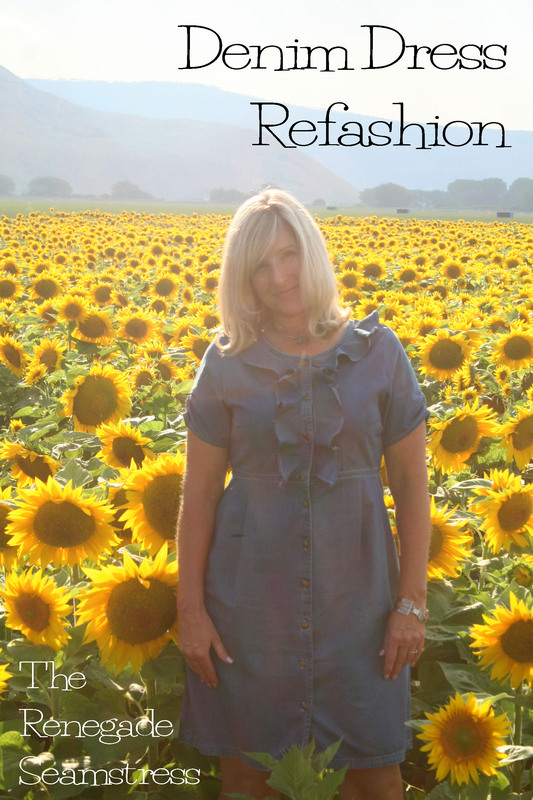 Click here for more refashion and sewing inspiration. 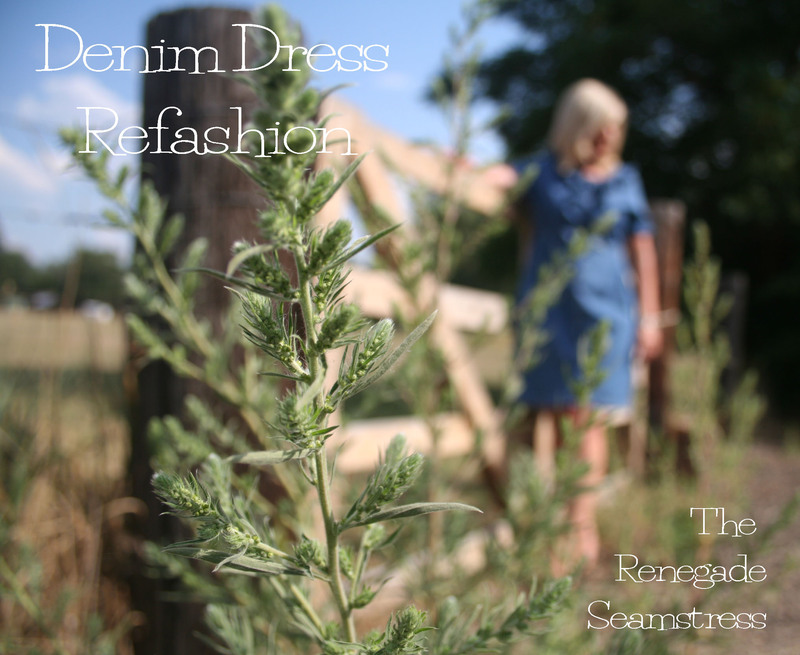 This entry was posted in Uncategorized and tagged alterations, clothing, denim dress, DIY, fashion, reconstructed clothing, recycling, Refashion, Sewing, Thrifting, upcycling. Bookmark the permalink. I LOVE it!!! Nice job! 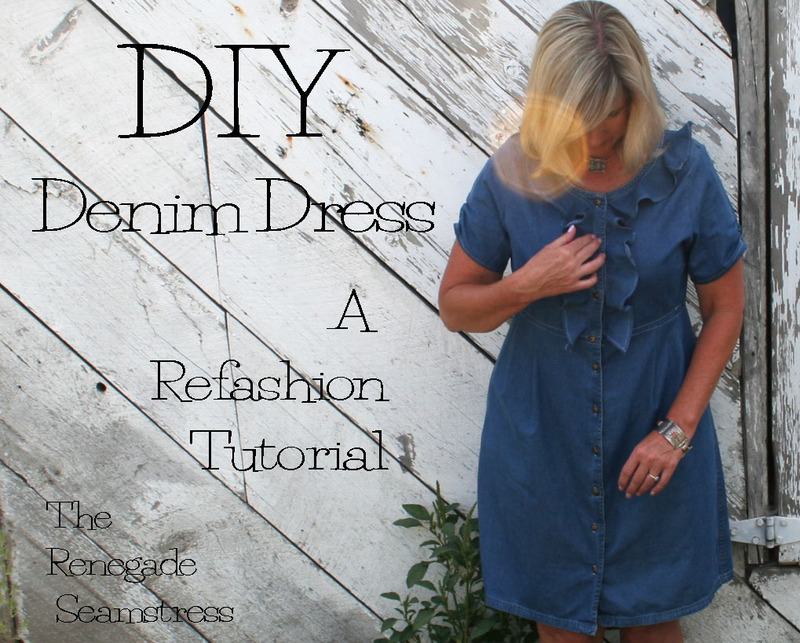 I have a denim dress very similar to your original one and have been waiting to find a way to life again!! Thanks so much for showing us your makeover! That would have been really cute as a sleeveless too. It’s been hot where I live in Northern CA. Like 110 degrees hot! Oh wow! 110 degrees definitely means sleeveless everything!!! My son is a firefighter and was just sent down to your area. Stay safe and cool, Sandra. Our area is devastated by this horrible fire. The biggest one we’ve seen. My family and I evacuated twice. Losing homes like crazy and hundreds of families lost everything. Thank him for his serve. We greatly appreciate it!!! !We need as many firefighters as possible. Oh my gosh Sandra! Are you in Redding? I can’t stop thinking about you all down there. It looks so scary. Please let me know if there is anything I can do for you!! Lots of families lost everything. Many families and pets displaced. Very scary. Haven’t seen anything like this in my life and I grew up here. It’s now traveling into Trinity county which is towards the Eureka coast (think hwy 299). Anything helps lots of organizations in this area graciously accepting donations including my church. 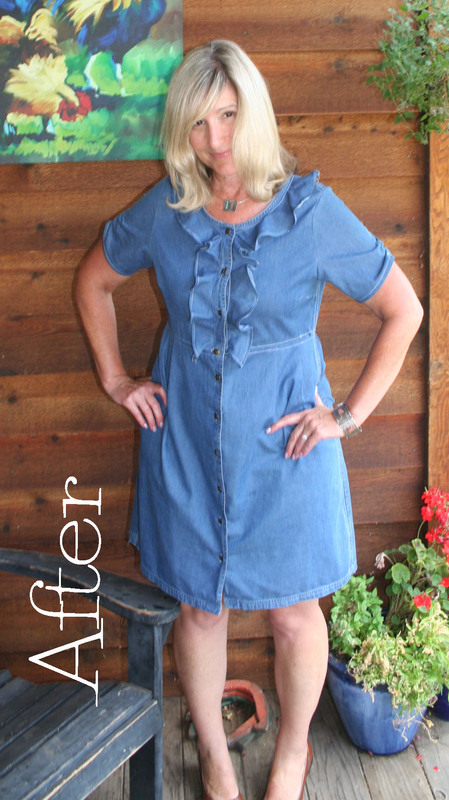 Beth,,,This dress is so adorable……I’m going to be looking for a denim dress now! Thank you Bonnie! I hope you find one. 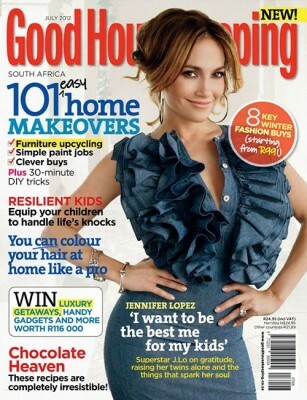 What a great refashion, totally love it. I like this & it all looks doable for me except maybe the ruffle. That might be a little tricky. Thank you for walking us through it. 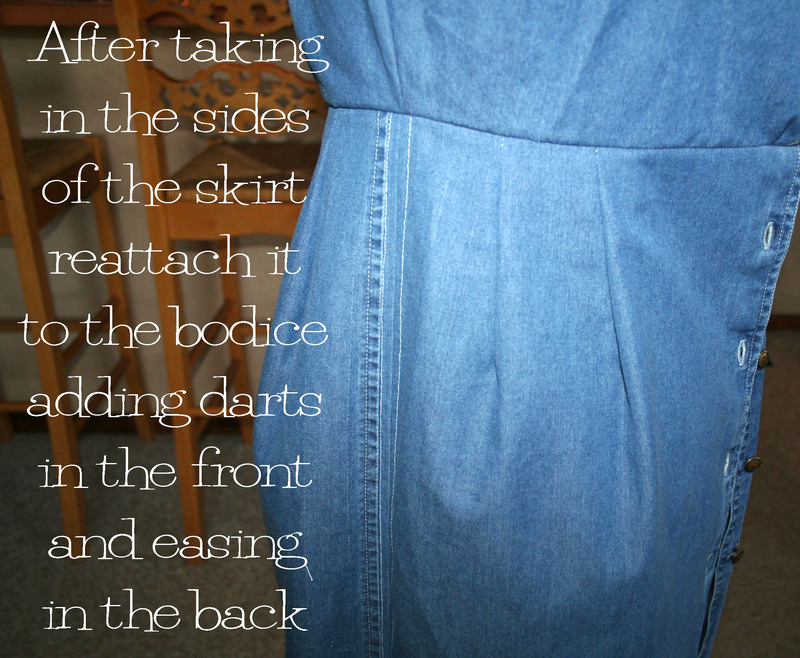 I’m going to look for a thrift shop dress to experiment on. You are so very welcome Carol. I hope you find a good dress. What a great idea for a quick upcycle. I’d love to see the vests you made sometime. 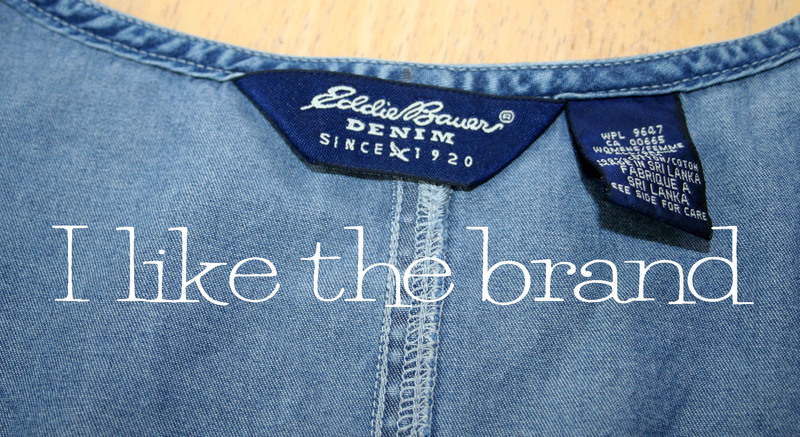 I LOVE this remix…I will have to look at thrift store fashions in a TOTALLY different way! LOVE IT!!! Impressive! And on point, as usual. What kind/brand dress form do you use? Have I missed conversation about it in your previous posts? Thank you Susan! I have a dress form that I bought at JoAnn’s. You are so fun to watch. You make it so easy. I just enjoy watching the process. Thank you for your words of encouragement!! You really brightened my day! Love this! 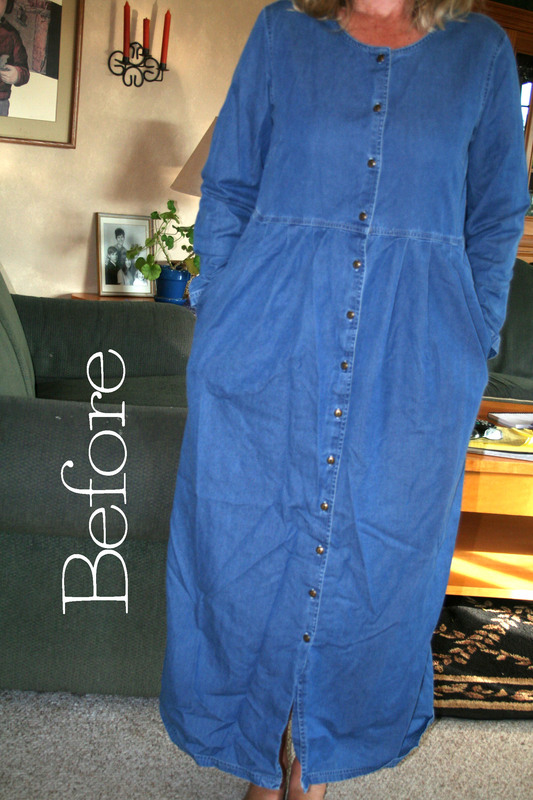 I remember when the before dress was the rage! Lol! You really took it up several notches! I especially love the ruffle. I love all things feminine, but not too frilly. Your restyle is right up my alley! Great job! Hi Ana Marie! It is so nice to meet you and to know that you are from Spain, makes it even better. How fun that we can live so far away but be connected. I love living in the times we do and to be able to know people that like to do the same things the I do from all over the world. 🙂 I’d love to see your refashions sometime, Happy Sewing! You are so nice. Thank you for your encouraging comment! !